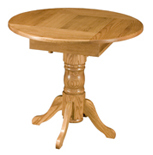 Have game night every night with Amish Furniture Factory's round game table! This small game table includes storage space to hold your favorite games. 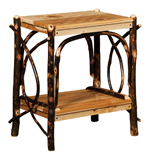 A checkerboard is always available at the cottage with the carefully patterned top of this twig end table. 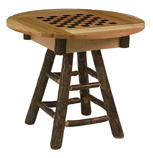 For checkers enthusiasts this twig end table has a checkerboard on top and a drawer to store your checkers. The cabin is the perfect retreat from electronics where you can sit down with friends and concentrate on board games. That's why this game table is a cabin essential. With a rustic log and twig base, it suits your cabin's style. It also comes handy with five game boards and matching pieces so you always know where they are.